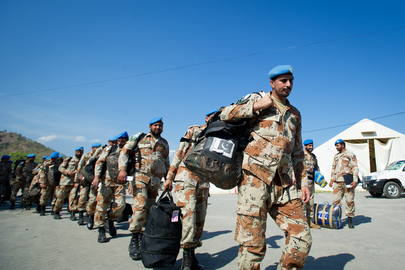 Pakistani police officers are shown shortly before boarding a return flight home as they end their service with the UN Integrated Mission in Timor-Leste (UNMIT). Pakistan is among the countries to have contributed the most police officers to UNMIT, roughly 900, since the mission’s establishment amid the Timorese crisis in 2006. Today Timor-Leste has assumed its own policing responsibilities, with democratic presidential and parliamentary elections held peacefully in 2012.